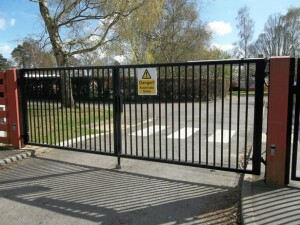 Metal gates and steel gates are a particular specialism of Tonbridge Fencing Limited. We have installed for manual use as well as automated a varied range of gates, from domestic to industrial, for a wide range of customers. Our experience and expertise means we can help you choose the best solution for your needs, whether it be a simple metal-hinged gate or a large cantilevered industrial strength sliding gate with a fully-integrated entry system. On our premises we have our own steel fabrication workshop where we make the gates. This means you can be sure of a strong, reliable, practical, and durable solution, all at a competitive price. All our steel gates can be galvanised, or galvanised and powder-coated in a wide range of colours to fit in aesthetically with their surroundings. 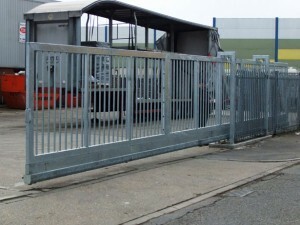 We hold large stocks of steel so we can supply most types of gates very quickly. We can also service and maintain existing automated gates, and also upgrade a current installation to higher specifications. Mesh security gates to match the mesh security fencing systems that we install. They are very robust and offer the highest level of security for use in Public areas, Sports and leisure facilities, Play areas, Schools, Colleges, Airports and Industrial sites available in many different specifications and colours, single gates or pairs of gates. We can install a access solution for any situation. A great way to add a elegant and traditional feel to your home or entrance. Beautifully crafted ornate gates, manufactured in our metal workshop here at Hadlow. 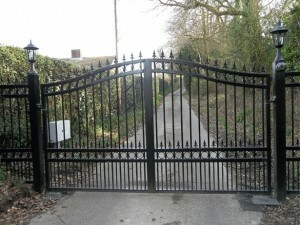 We have many designs and styles to choose from, or we can make the gates bespoke to your specification or design. These gates can be automated or manual operated. Sliding gates are ideal to be used when there is limited space or as a neat alternative to a traditional swinging gate system. We can install timber or metal sliding gates and have a wide selection of styles and solutions available. These can be manually or automatically operated. The two types of sliding gates are Cantilever gate which does not have a ground track or sliding tracked gate which runs on a track on the ground across the opening. We can install the perfect access solution to meet your needs, commercial or industrial. 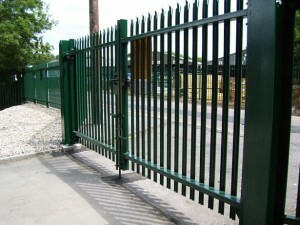 Metal palisade security gates to match our high security steel palisade fencing. Available in a galvanised finish or many different powder coated colours. We can also manufacture bespoke steel palisade gates in our workshop on site. We can install swing steel palisade gate or sliding palisade gates depending on the best solution to solve your access requirements. 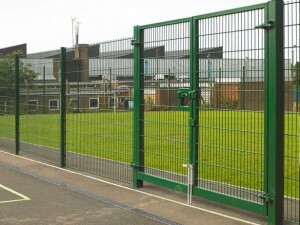 Very much a standard secuirty solution for Schools, Colleges and Local Authorities and also for Industrial Perimeter Fencing, Utilites sites, HGV car parks, Storage Depots. Vertical bar gates to match fencing square and round bar fencing as with the fencing the bars and gate designs can come in many shapes and sections from round tops,spikes, or cranked tops. and we can also always manufacture a bespoke design to suit your requirements. We can install a wide range of vehicle mitigation solutions and vehicle barrier gates. Ranging from security barriers to automatic raise arm barriers for schools, businesses & industrial premises. 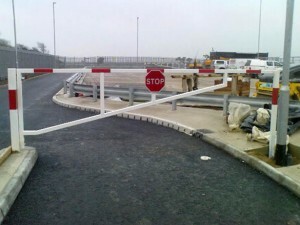 We can also install parking solutions including, Security bollards, Parking barriers, Rising bollards & Road blockers. We can tailor your solution depending on your needs. We can also make bespoke gates, bollards and entrance solutions in our metal workshops on site at our Hadlow site.